Just before our Spring Break, our school conducted two days of Student-Led Conferences. This year, my teaching partner and I wanted to set them up a little differently from the norm at our school. Typically, the student, parents AND teacher would sit together and go through previously marked and annotated samples of work from the child’s portfolio. What evolved, was valuable discussion but more of a three-way conference than one that was genuinely student led. As we were preparing to begin the Exhibition, we wanted a more authentic, student-led component. We wanted the parents to come to their child’s place of work to meet with them in their professional environment. We wanted autonomy for our kids. We wanted them to share their work, their understandings and their goals, using their portfolios as a tool for sharing. Most of all, we wanted to empower our students and make sure they were supported by us through the process. In order to achieve this, we had them look at the Transdisciplinary Skills alongside their porfolios and identify where they had struggled or succeded, documenting evidence from their own work. Having done this, they looked at their notes and wrote goals for each section of the TD skills: research, communication, thinking, social, and self-management. But we were not yet finished. As we sat down with each child’s work prior to the conferences, we could tell that the goal-setting needed some work. The goals were vague. They didn’t really make sense and they seemed more like the kids were writing them because they had to rather than because that was actually the areas they wanted to focus on in their last eight weeks of life as an elementary school student. What they needed was one-on-one discussion to flesh them out, further explanation to really get to the crux of the child’s area of focus and parental buy-in to ensure the child was supported in the pursuit of their goals and they were just not something we could ‘check off’ our list of teacher to-do’s: Have children make goals and show parents we do that – CHECK! What we ended up doing, was using our goal sheet as the major focus of the conference with the portfolio in the role of supporting artist to be referred to for evidential support. The discussions between parents and their kids were fantastic. Having goals is a pain in the neck. If you don’t have a goal (a corporate goal, a market share goal, a personal career goal, an athletic goal…) then you can just do your best. You can take what comes. You can reprioritize on a regular basis. If you don’t have a goal, you never have to worry about missing it. If you don’t have a goal you don’t need nearly as many excuses, either. Not having a goal lets you make a ruckus, or have more fun, or spend time doing what matters right now, which is, after all, the moment in which you are living. The thing about goals is that living without them is a lot more fun, in the short run. It seems to me, though, that the people who get things done, who lead, who grow and who make an impact… those people have goals. 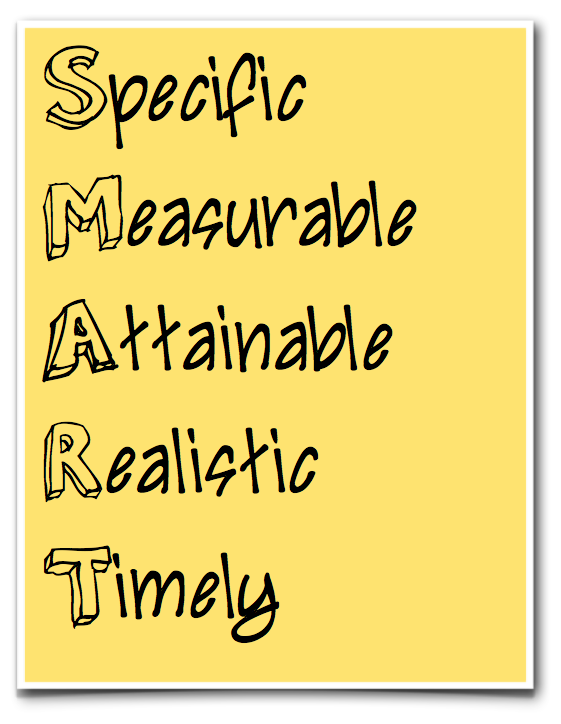 I have heard about SMART goals before. 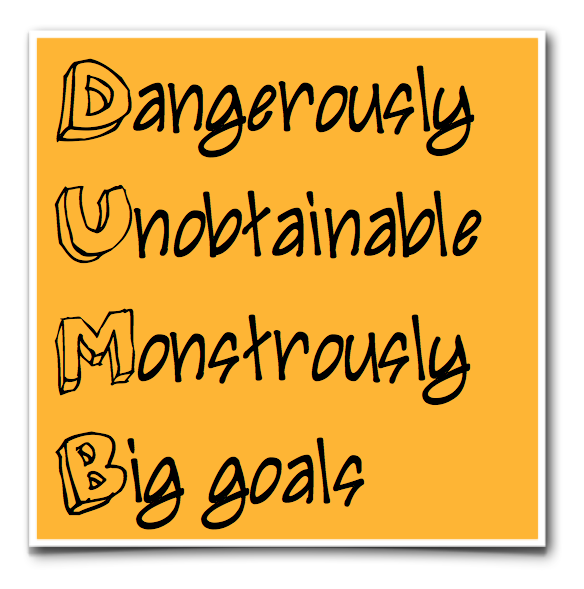 But today I found out about NICE goals, DUMB goals and BHAG goals. I wish I had known about these when we did it. Luckily, it’s never too late to learn something new, so I think I will share these with my kids next week. Take a look at the types of goals you may have encountered or are currently working towards (below). Who will you share these with? Or are they even worth sharing? Further research led me to a Squidoo lens on Creative Goal Setting. For a wealth of information on this topic click here. There is more here than you could EVER need to inspire a more creative approach to setting goals. 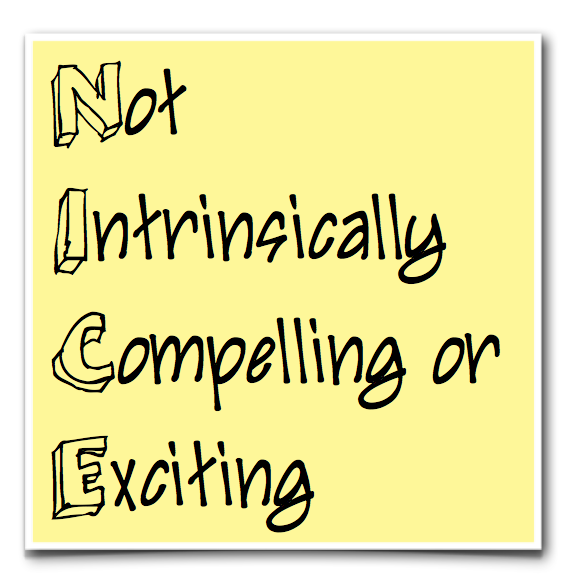 I am now going back there to investigate further and see if I can’t find something better than NICE or SMART…. Next postInspire My Kids…and yours, and theirs….